Tip: Before the Umbrella. Before becoming eligible for umbrella insurance, you may have to maximize coverage on your homeowner’s and car insurance policies, as these become deductibles to an umbrella policy. Umbrella liability insurance is designed to put an extra layer of protection between your assets and a potential lawsuit. It provides coverage over and above existing automobile and homeowner’s insurance limits. For example, imagine your teenage son borrows your car and gets in an accident, seriously injuring the other driver. The accident results in a lawsuit and a $1 million judgment against you. If your car insurance policy has a liability limit of $500,000, that much should be covered. If you have additional umbrella liability coverage, your policy can be designed to kick in and cover the rest. Without umbrella coverage, you may be responsible for paying the other $500,000 out of pocket, which could mean liquidating assets, losing the equity in your home, or even having your wages garnished. Umbrella liability insurance is usually sold in increments of $1 million and generally costs just a few hundred dollars a year. It typically covers a broad range of scenarios, including bodily injuries, property damage caused by you or a member of your household, even libel, slander, false arrest, and defamation of character. Even if you don’t yet have a tent in the millionaire camp, you may want to consider the benefits of liability insurance. You don’t have to be a millionaire to be sued for a million dollars. Anyone who is carefully building a financial portfolio may want to limit their exposure to risk. Umbrella liability can be a fairly inexpensive way to help shelter current assets and future income from the unexpected. This is a simplified description of coverage. All statements made are subject to the provisions, exclusions, conditions, and limitations of applicable insurance policies. Please refer to actual policy documents for complete details regarding coverage. In 2017, there were about 31 million households in the United States whose net worth was in the $100,000 to $1 million range (excluding primary residence). 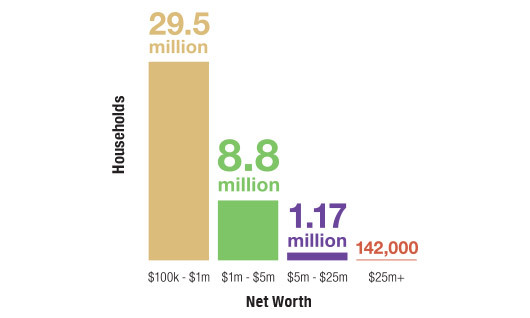 Only 172,000 households had a net worth of $25 million or more. The content is developed from sources believed to be providing accurate information. The information in this material is not intended as tax or legal advice. Please consult legal or tax professionals for specific information regarding your individual situation. Some of this material was developed and produced by FMG, LLC, to provide information on a topic that may be of interest. FMG, LLC, is not affiliated with the named SEC-registered investment advisory firm. The opinions expressed and material provided are for general information, and should not be considered a solicitation for the purchase or sale of any security. This website is a publication of SCHWARZ DYGOS WHEELER INVESTMENT ADVISORS LLC. The firm is registered as an investment advisor with the SEC and only conducts business in states where it is properly registered or is excluded from registration requirements. Registration is not an endorsement of the firm by securities regulators and does not mean the advisor has achieved a specific level of skill or ability. Information presented is believed to be current. It should not be viewed as personalized investment advice. All expressions of opinion reflect the judgment of the authors on the date of publication and may change in response to market conditions. You should consult with a professional advisor before implementing any strategies discussed. Content should not be viewed as an offer to buy or sell any of the securities mentioned or as legal or tax advice. You should always consult an attorney or tax professional regarding your specific legal or tax situation. Articles and videos were prepared by a third-party provider. Hyperlinks on this website are provided as a convenience. We cannot be held responsible for information, services or products found on websites linked to ours. Different types of investments involve higher and lower levels of risk. There is no guarantee that a specific investment or strategy will be suitable or profitable for an investor’s portfolio. There are no assurances that a portfolio will match or exceed any particular benchmark. Asset allocation and diversification will not necessarily improve an investor’s returns and cannot eliminate the risk of investment losses.